Although Surrey Chapel is a modern, busy church, we can trace our roots back over 150 years in Norwich. Surrey Chapel was founded by Robert Govett. He had come to Norwich in 1841 as a curate at St Stephen’s Church, where his evangelical preaching attracted large crowds. But in 1844 he left St Stephen’s and began holding regular services for a large group of followers in a hall in Norwich. In 1854, mainly at Govett’s own expense, a large brick and flint chapel was erected in Surrey Street. It was called ‘Ebenezer Chapel’, but soon became known as ‘Surrey Street Chapel’, and finally just ‘Surrey Chapel’. 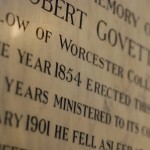 Robert Govett was still preaching with great vigour at the age of 87, just before his death in 1901. David Panton, who had assisted Govett, was invited to become the second pastor of Surrey Chapel. He too was a great Bible teacher, drawing huge crowds at prayer meetings, Bible studies and Sunday services. The Sunday School had over 600 children and the Chapel sent many missionaries to serve overseas. Panton retired in 1941 after 40 years as pastor. The Chapel was then without a pastor until John Clark was appointed in 1948. However, after three years of faithful ministry, Clark returned to missionary work in Ecuador. A period of decline in the life of Surrey Chapel followed, as the church was without a pastor until 1963. David Middleton – who had come to faith as a young man in Surrey Chapel and gone on to study at London Bible College – was then invited to become pastor. And so a third great Bible teacher came to Surrey Chapel. The church began again to grow in numbers and in spiritual life. In the 1980s the crumbling Victorian building and surrounding developments led to the church’s decision to relocate to its present site, in 1985. Although the church was no longer in Surrey Street, the name, Surrey Chapel, was retained, because of its historical significance. David Middleton retired with ill health in 1995 and died in 1998. The Chapel continues as a centre for Bible-based ministry, following the appointment of Tom Chapman as pastor in 2002. Sadly, Pastor Tom Chapman died in September 2017 following a ten year battle with a brain tumour. His ministry will be missed but he has left a tremendous legacy for which we are grateful to our Heavenly Father. Gary Ryan was appointed as part-time assistant minister in 2011 and was appointed as a full time pastor in January 2018. A booklet outlining the history of Surrey Chapel, Norwich, prepared for our 150th Anniversary by Dr Ros Codling, is available to download here.